As a Welshman with Irish family connections, I make frequent trips to Ireland. Generally, I travel from Fishguard but recently I took the day crossing from Pembroke Dock. Taking that crossing also gave me an opportunity to take a good look at what I truly believe will be a major asset to a future Independent Wales: the Milford Haven Waterway. Standing out on the deck of the Isle of Inishmore on a breezy summer’s day I look out on a veritable hive of activity. Fishing boats docked with their catch. Speedboats scudding along the calm waters. Tugs patiently nudging their giant wards into position; the huge LNG and oil tankers that serve the massive storage and refining facilities that sprawl along the northern and southern shores of the waterway. To those nay-sayers that argue “Wales has no resources”, I ask the question: what are all these energy companies doing out here in Pembrokeshire then? And when we say “resources” it’s important to realise that not all our resources are physical; sometimes they are strategic. They confer great advantages simply by virtue of their nature and key position. The Haven is just such a resource and nothing brings home its importance more forcefully than standing on the deck of a big boat wending it’s way past the numerous military fortifications that dot the shores here. Forget Welsh history for a minute and consider that Britain was a global maritime power. Its power was built on places like this and that power had to be defended. The Haven Waterway has been hotly contested for over a thousand years. In the 9th and 10th centuries, the Haven sheltered Viking raiders. In 1171 Henry 2nd raised a massive naval force of 400 ships in the waterway and set sail for Ireland. In 1405 the French landed 2500 troops here in support of Glyndŵr. They marched north and laid siege to Haverfordwest Castle. Henry VII began his bid for the Crown here. In 1597 the Haven was targetted (unsuccessfully) by the Spanish Armada. In 1802 Nelson visited the area and commented on Milford Haven’s strategic importance as a major seaport on the western coast of Britain, comparing the Harbour to Trincomalee in Sri Lanka as two of the best he had ever seen. Key settlements on the Haven reflect the military priorities of Empire. The two largest towns – Milford Haven and Pembroke Dock – started life as Naval dockyards. Hundreds of ships were constructed here. A ring of Fortresses was constructed around the Haven to defend them. Yet Unionist delusions to one side, the Empire is long gone. And with it much of the ship-building. Today the Haven is branded by the Milford Haven Port Authority as “The UK’s No.1 Energy Port”, the country’s largest handler of oil and gas”. And they’re not far wrong. On the south side of the waterway sits Pembroke 1 Power Station – at 2000Mw one of the largest gas-fired power stations of its kind in Europe. On the northern shores of the waterway sits the largest LNG terminal in Europe. Together, the South Hook and Dragon LNG terminals can supply up to 30% of the UK’s gas supply. A deepwater port sitting in close proximity to the key Atlantic trade routes, the waterway is Wales gateway to the wider world. As my ferry eases its way past the town of Milford Haven the gigantic figure of an LNG tanker – Al Amriyah – looms into view on the starboard side, moored at the South Hook LNG terminal. I smile at the irony of the fact that much of our gas is now supplied by a nation even smaller than Wales; Qatar. A country which gained it’s independence from the UK back in 1972 and hasn’t looked back. But while Wales has significant gas resources of its own, wealth can be won from the transport of gas as well as it’s production. Regassified methane from the LNG terminals is transported across Wales in a massive gas pipeline at tremendously high pressure. Questions remain around the routing and integrity of this pipeline. But while London has decided that Wales should shoulder the risks, an independent Welsh state can capture the rewards. All over Europe and beyond, nation-states charge “transit fees” for the routing of high-pressure pipelines across their territory. Based on typical European figures and data provided by Dragon and South Hook LNG, Wales could net up to £150 million a year simply for the transport of gas across our territory to our larger neighbour. Sit back and consider that figure for a minute. As it stands, every year up to £150 million of wealth simply bypasses some of the most deprived communities in the whole of Wales, on it’s way to the wealthy centres of power in England. In the shadow of some of the largest energy installations in Europe, parts of Milford Haven and Pembroke Dock rank amongst the top 20% most deprived areas of Wales and dedicated charities such as PATCH (Pembrokeshire Action to Combat Hardship) work against the rising tide of poverty rolling across the County. In September, meanwhile, the Universal Credit programme rolls into Pembrokeshire. Just in time for Christmas. 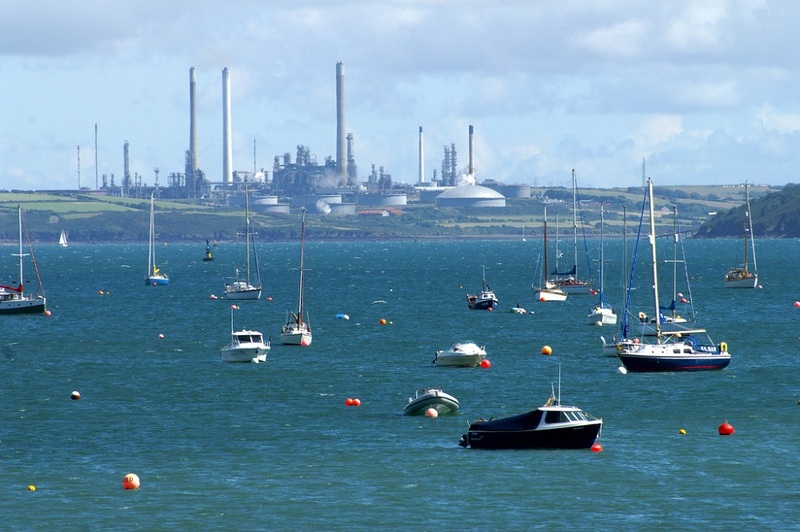 But while the true benefits to the local population of the extensive industrial development around the Haven Waterway to date are highly questionable, the massive renewable resources of Pembrokeshire offer the possibility of future wealth. They must, however, be harnessed by an independent Welsh Government committed to weaning us off fossil fuel dependency. While the proposed Tidal Lagoon in Swansea Bay has generated more controversy than electricity to date, around the Haven Waterway no less than five small-scale tidal electricity projects are currently under development. The Welsh coastline has a massive wave energy resource. The Welsh Government estimates that there is the potential to deliver 6.4 Gigawatts of generating capacity, far in excess of our needs. Of this, the majority is concentrated around the coasts of two Counties: Ynys Mon and Sir Benfro. As we clear the little lighthouse on St. Ann’s head the Haven opens out onto the shimmering vastness of the wild Atlantic Ocean. In the distance my destination, Ireland. Beyond that, nothing but the New World. It occurs to me that here in the Haven Waterway, remoteness from London does not equate to separation from the rest of the planet. Far from it.